For our last day in Siem Reap, my mum and I decided to venture a little further afield and took a tuk-tuk out to a set of lesser explored temples east of the city, in the town of Roluos. 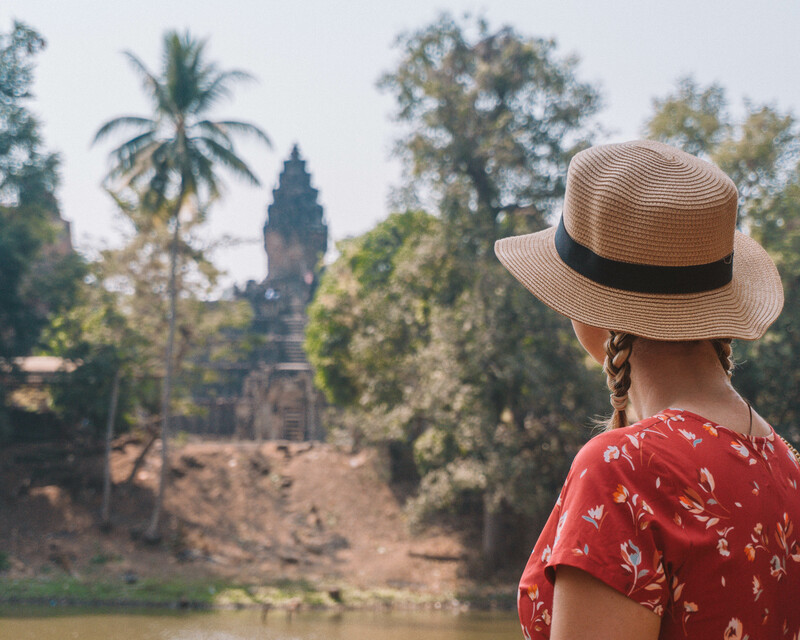 While the scale of Angkor Wat is mesmerising, and the millions of faces at Bayon are captivating, I actually had the most fun on our final day exploring this trio of quieter and older temples. 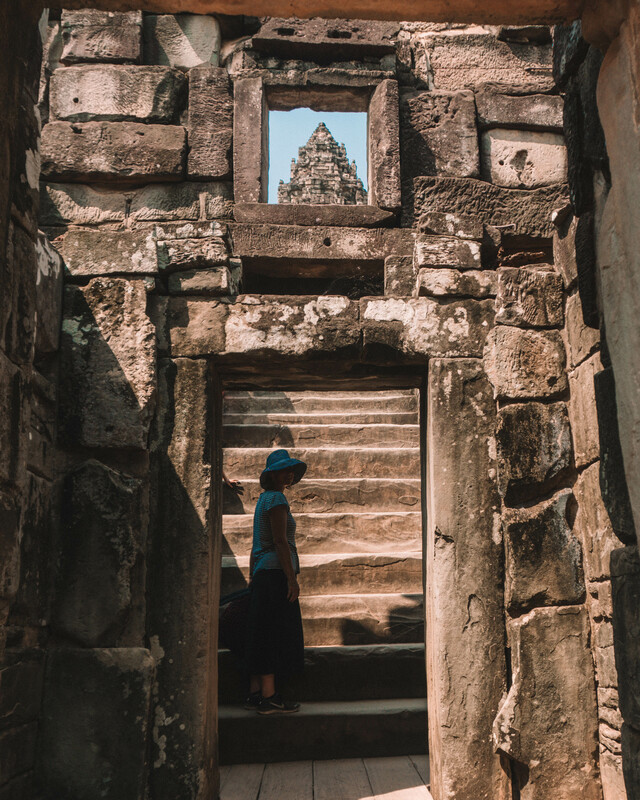 Here’s all the details so you can also venture beyond Angkor and explore the peace of these temples in Roluos! 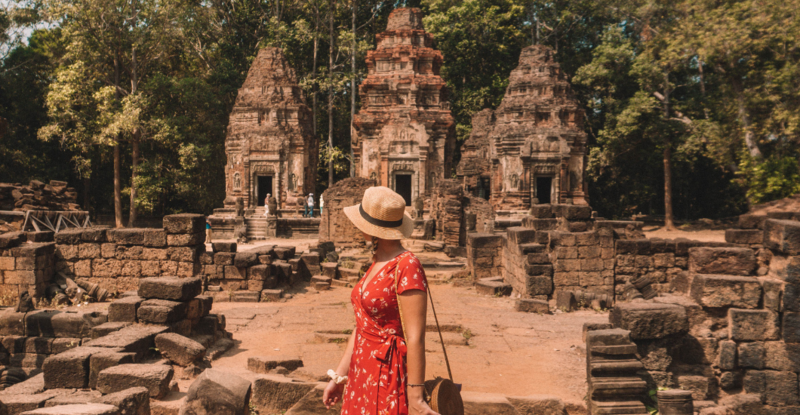 The three temples that we explored on our final day in Siem Reap were Preah Ko, Bakong and Lolei, collectively known as the Roluos temples. They were all built in the late 9th century by King Indravarman I, who’s ancient capital of Hariharalaya was located here, where the current day town of Roluos is situated. 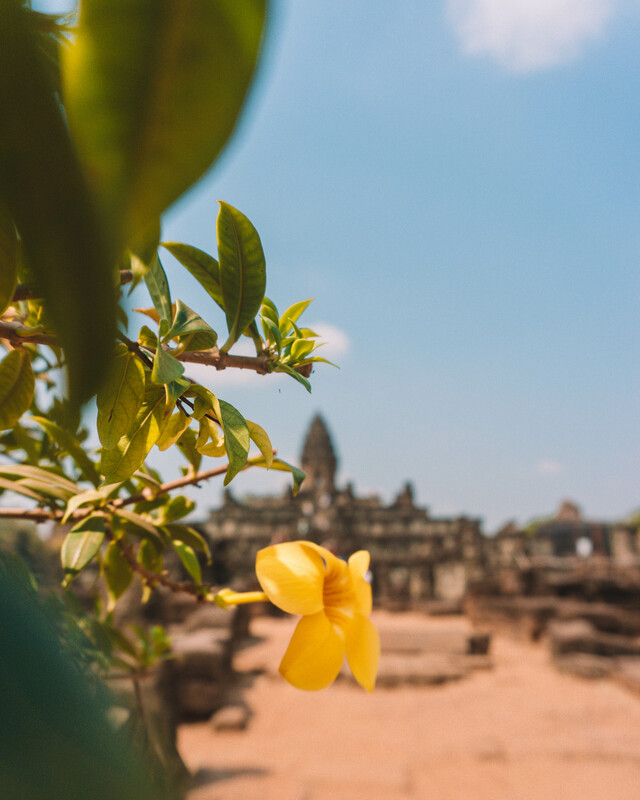 The temples of Angkor weren’t built until the 12th century, so this trio of temples pre-dates the nearby Angkorian temples, making them some of the oldest temples in Siem Reap. Don’t fancy reading through all the juicy details yet? Click to explore the different temples! 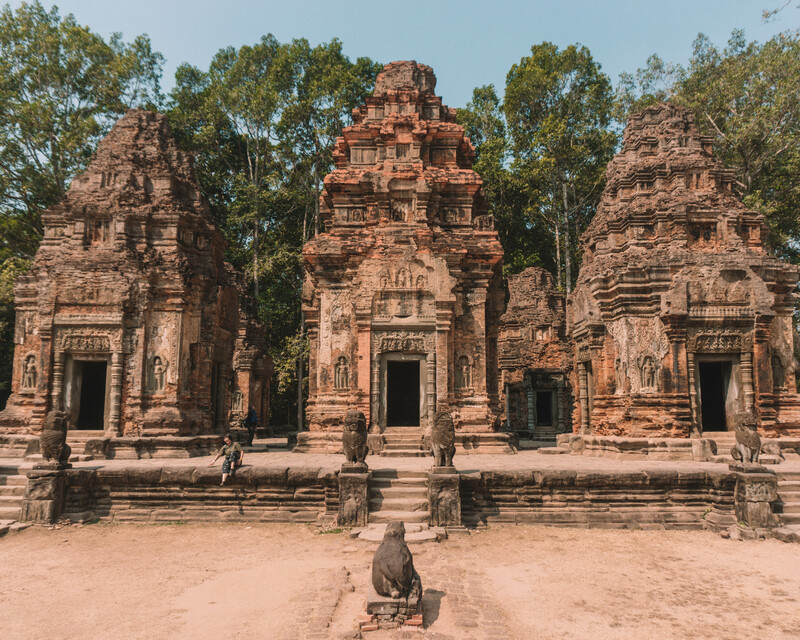 The first temple you come to in this trio of pre-Angkorian temples is called Preah Ko. The name translates to the temple of the sacred bull, so named for the three kneeling bulls facing the towers. 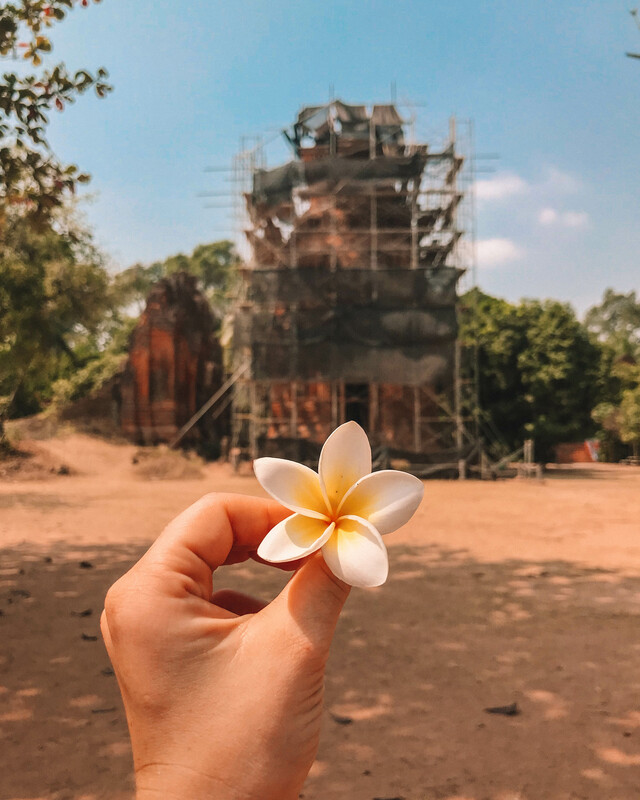 Built in the year 879, Preah Ko was actually the first temple to be built in this area (and one of the first permentant structures built by the Khmer). 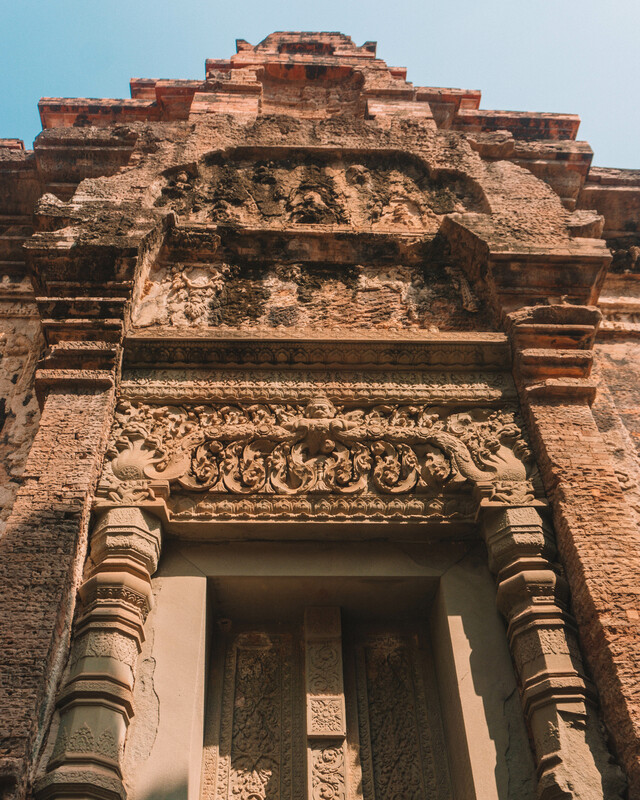 Preah Ko was built as a memorial temple for the forefathers of King Indravarman I. It has 6 main brick towers; 3 towers at the front are dedicated to Indravarman’s forefathers and 3 at the back dedicated to their respective queens. As with most of the temples here, Preah Ko was originally build as a Hindu temple and later converted into a Buddhist temple. There has been some conservation work done on the towers, which makes it easy to spot details like the male and female statues identifying who each tower is dedicated to. This, along with the peace and quiet, landed Preah Ko a spot as one of my favourite temples in Siem Reap. The next temple in this little trio of temples at Rolous is Bakong temple, the first ever mountain temple. 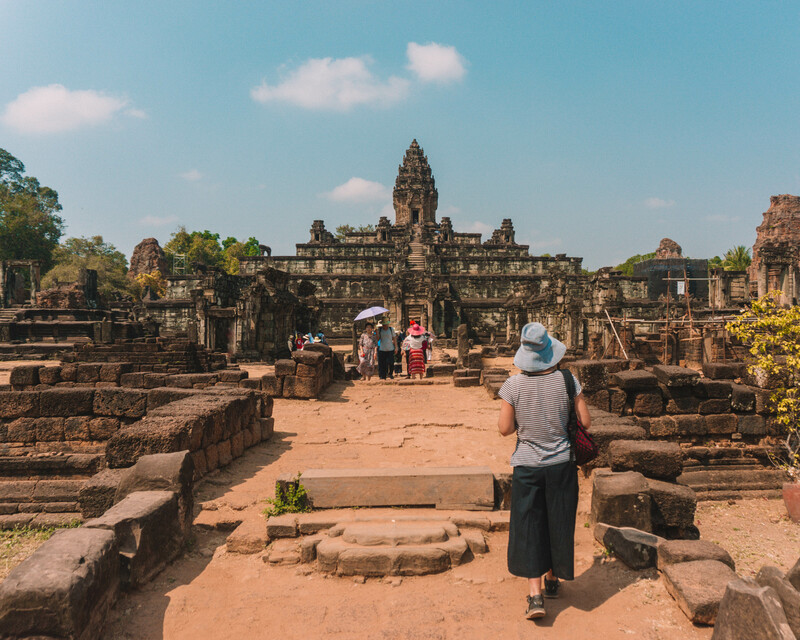 My mum and I loved exploring Bakong as it felt so much more manageable than the other temple mountains we had explored during our three days in Siem Reap! The style is quite unique and can be seen a lot throughout later temples built in Angkor, including Angkor Wat, Bayon temple and Phnom Bakheng. These so called mountain temples are built from stepped layers, kind of like a pyramid, reaching up to a pinnacle shrine. The design is thought to have been inspired by temples in Java, Indonesia, as it closely resembles Borobudur temple which was built around the same period. The four corners of the terraces have elephant statues. While a lot of the statues have unfortunately weathered away, you can imagine how grand a site this temple was in its heyday, especially with the moat leading up to it. Infact Bakong was designated as the official temple of King Indravarman I, back when his ancient city of Hariharalaya was located here. Nowadays you’ll find a modern monastery on the moated island, as well as lots of conservation work. Conservation is currently focused on the towers surrounding the main temple mountain and a few have been completed so you can see what they would have looked like in their prime. The final temple on our little day trip away from Angkor was Lolei temple, the last temple to be built in the Rolous area. We found this to be the least impressive of the 3 temples we explored this day, but it remained a welcome slice of peace and quiet. Lolei temple was the last temple built by King Indravarman I. It was dedicated to him and his father before him, by his son Yasovarman I who succeeded the empire. As with the brick towers at Preah Ko, the two front towers at Lolei are dedicated to his male family; one for the recently deceased King (Yasovarman’s father), and another for his grandfather. While the two rear towers are dedicated to the females; one for his Yasovarman’s mother and one for his grandmother. Apparently Lolei temple was originally built on an island, so was surrounded by water. Nowadays there is no inkling that there was once a lake here so it’s quite hard to imagine what it would have looked like 12 centuries ago! The site is currently under lots of conservation work and is now home to a working monastery with a village and school built next to the ancient ruins. This trio of pre-angkorian temples are situated about 13km east of Siem Reap city, in the modern day town of Roluos. As you can see, the road there is more or a less straight shot and local tuk-tuk drivers will know how to take you to the Roluos temples. There are tour buses bringing people here, the same as the temples in Angkor, but substantially fewer. There are touristy items for sale plus lots of water and snacks so don’t worry about not being able to find things. How to get there: We rented a tuk-tuk from our hotel to take us around this trio of temples of Roluos. It cost us $15 for the half day. Duration: Exploring the three temples took us around 3 hours, including travel time. Price: We used the final day of our 3 day temple pass to visit these temples. You can buy a 3 days pass for $62 or a 1 day pass for $37. The ticket office is on the way to Angkor so not a convenient route to visit these temples beyond Angkor. I highly recommend venturing beyond Angkor: You’ll be spoiled by the peace and tranquility of this trio of 9th century temples at Roluos!